For a season that promised so much, things are looking rather bleak for Arsene Wenger and his team. 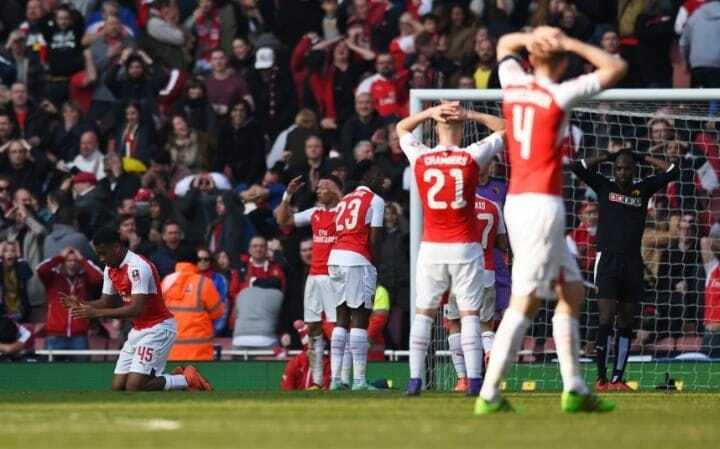 After so much unnecessary talk of how the players held some top secret closed doors meeting where nuclear launch codes were shared among the lads, it was back to the same feeling of frustration and despair as Arsenal allowed Watford to come to the Emirates and leave with a victory – a game the Gunners dominated from start to finish. We all know possession of the ball isn’t enough – it’s what you do with it that matters. There were the missed chances, as you expect from a pathetic profligate team like Arsenal. Mohamed Elneny was culpable for the kind of misses we the fans usually throw abuses on Aaron Ramsey. Then there was the goal from Olivier Giroud that was rightly ruled offside. Could he have timed his run better? Of course, yes! With more missed chances I feared that the visitors would show the Gunners how to finish and sadly, I was right. Odion Ighalo used his strength to shove off Gabriel before placing the ball past David Ospina. Its moments like that they showed how important Laurent Koscielny is to the team because I would have been confident that he would not allow a forward bully him like that, inside his box. After waiting for Wenger to find a replacement for Thomas Vermaelen, Gabriel Paulista has shown that he has a lot to learn and it’s unfortunate to see how his naivety is costing us games. Not like I’m a fan of the blame game but there have been games were better basic defending from a better defender would have been enough to quell a lot of attacking threats. He may grow in strength to become an Alessandro Nesta or something in the future but at this moment, he’s looking more like a liability than an asset. With the Gunners chasing the game, Watford hit them on the break and I wondered where everybody was when Guerdiora was allowed to pick his spot to send a piledriver through Ospina into the net. A part of me feels that the Colombian shot stopper could have done better but with the Gunners trailing with two goals, I knew the game was over. Wenger ‘responded’ with three substitutions of Danny Welbeck, Alex Iwobi and Theo Walcott. Two of the three made their presence felt in the game, while Walcott proved yet again to be a waste of a substitution. Welbeck huffed and puffed but finally made his mark when he latched onto a brilliant back heeled pass from Mesut Ozil to side-foot the ball home. Iwobi and his Fransceco Totti-esque socks showed great movement and confidence with the ball. His moment of glory almost arrived when he fired a shot that hit the post and ricocheted off the goalie but Welbeck’s rebound was poor to say the least. At the end, it was Watford that went to the semis and the Gunners are set for more misery with the fact that Tottenham are closing the gap on Leicester with another win over relegation-bound Aston Villa. Everyone will be waiting for Rafa Benitez to work his magic on Newcastle as they take on Leicester tonight but one wonders where the Gunners will go from here. I like Arsene Wenger and everything he has done for this great club but I’m really scared for him right now. The team has become so impotent in front of goal, especially at the Emirates, and so many players are underperforming below what they are usually capable of. I am filled with sadness today but as an Arsenal supporter, I must keep the faith that something, could still happen in the Premier League. I have already written off our chances in the Champions League because of the sheer brilliance of FC Barcelona but as long as it is still mathematically possible to win the Premier League, I will not give up hope. Posted on March 14, 2016, in Arsenal, FA Cup, Football and tagged Arsenal, FA Cup, Football. Bookmark the permalink. 2 Comments. Per Mertesacker… that’s it period end of story!!! Arsenal seem to be going through a ruff patch at the moment, but i’m sure they will come good, could be worse you could be a Liverpool fan.